Taking the misery out of separation anxiety is an issue that most dog owners experience at times. It is an unfortunate fact that the majority of dogs suffer anxiety when they are left alone. This anxiety can happen when a dog is left alone at home. Separation anxiety can happen when it’s necessary for a dog to have a period of time in a boarding kennel. 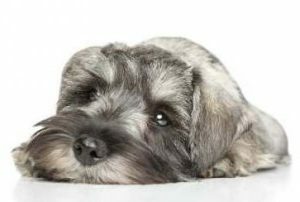 Whether your canine pet is an adult dog or still at the puppy stage, and whether he is a Miniature Schnauzer or another breed of dog, anxiety separation is something that, as dog owners, we have to face at certain times. The separation of a dog from its owner can be devastating for the dog. It is important that we think about how our dog feels when he suddenly finds himself alone at home, or in a strange place with people he does not know, such as being boarded in Kennels. I’ve known adult dogs, and puppies, that have dealt with separation from their owners without being too disturbed. In fact I know one particular little Dachshund that becomes so excited when he realizes that the car is heading in the direction of the Boarding Kennels, he starts wagging his tail and yelping with glee. It is obvious that he has a great time when he’s holidaying with his canine companions. He is of a friendly nature, very outgoing and interested in what is going on around him. His owners travel three to four times a year to different countries and therefore this dog has many holidays at a Boarding Kennel, being the same venue each time. Obviously he is well treated and cared for while on his holiday at the Kennels and he recognises that ‘it’s not all that different from home because people are kind to me here too’. The length of time this puppy stays away from home is seldom more than 2 – 3 weeks so although that is quite some time in a puppy’s life, it is time that he can handle without having his family around him. Now, that is one happy little dog, but what about all those puppies and dogs that fret tremendously when they have to leave their families and go into Boarding Kennels? This can be an emotional time for dogs and owners. I’ve experienced such times when one little Sydney Silky Terrier in our family just couldn’t handle being away from home. We did everything we could to avoid placing him in Boarding Kennels but there were a few times when it was inappropriate for him to go away with us. His nature. He was a puppy that wasn’t good at amusing himself. He loved to have family as well as visitors around him and would go out of his way to entertain visitors by showing off what he could do with his toys. Other than entertaining visitors, his toys didn’t mean a lot to him. Being with family and people he knew was what kept him happy. He did not stay in Boarding Kennels often as we were able to take him to most places we visited. This probably helped to make him feel more important when he was around family and friends, as opposed to being boarded where he didn’t know people and was just one of many, as he probably felt. Perhaps we should have boarded this wee dog for an overnight stay every so often to help him overcome his fear, but it just didn’t seem worthwhile putting him through the agony he would have experienced. I doubt that any regular short-stays away from home would have made things better for him. Sadly his separation anxiety problem was deeply instilled and maybe if we had been aware of this when he was a young puppy, steps to counteract the problem may have helped. It is obvious that dog separation anxiety is huge and there is not a ‘one-fits-all’ remedy, but here are a few tips that you may find worthwhile considering if you are about to adopt a new puppy, or are already the owner of a young puppy. Are you away from home regularly on business? Do you like to frequently have weekends away from home where you cannot take your puppy? Do you often travel to other countries or faraway areas in your own country, thereby raising the need to board your puppy in Boarding Kennels while you are away? It is essential to consider these types of instances prior to adopting a puppy into your family, and if your lifestyle is similar to the above then how will you arrange the best care for your pet? If you are in the process of adopting, consider the dog’s breed and nature and how adaptable he is likely to be to new environments. Will this puppy fit into your life-style? Will your life-style be detrimental to the happiness and stability of your puppy when it comes to you being away for lengthy periods? Also how will that reflect on your own feelings because as a dog owner, of course you love your pet, and of course you want the best for him or her? It seems easy now but, when realism that your pet is fretting hits you for the first time you are sure to have regrets about his welfare while you are absent from his life. A dog’s behavior with separation can be similar to child’s separation from it’s family – some children can handle being away from their family for a few days or maybe a week or two. Other children, and many of them, just cannot cope with the homesickness they experience. And, it doesn’t make a difference how you try to encourage your child to cope with being away from the family, they are who they are and you cannot change that. With a puppy, this is more so. You cannot make a puppy understand that you will be back to pick him up in a day, a week, a fortnight. That is not within his comprehension. Yes, there are the well-known things you can do to help your puppy while boarding in Kennels, such as taking his favorite blanket and toys with him and that certainly does help. But it will only help a puppy who is able to handle the absence of his owner reasonably well. And there is one thing for sure, a dog never forgets – it’s not just the elephant who never forgets, I can assure you it’s your dog as well. Once a year I visit some of my family who live in another city far away from my home. Their dog greets and knows me as though I’ve been there all year. I’m the only visitor who enters that property without being greeted by loud barking, as in ‘who is this stranger’. No, I’m not a stranger to Zico as he remembers me twelve months apart at a time. For help with training your puppy, whether it’s separation anxiety, puppy not listening to you, or general dog obedience problems, I recommend that you take a look at the advice of the Online Dog Trainer, Doggy Dan. I have a 7 month mini Schnauzer that i’m worried that she may have separation issues. She cries and howls and i’m only getting the bin in. She follows me from room to room. When we are going out and I put my walking gear on and she jumps up my legs while putting socks and boots on and is whimpering like a baby all the time until we go. Yet when hubby goes to work no problem she is used to that every morning and i don’t come down for another hour and all is quiet. She roams our garden for hours if I let her, whilst i’m inside so doesn’t mind being on her own then. Do we have a problem? Hi Ann, I would say you to do have a problem with your mini Schnauzer. However, I don’t believe it is a separation problem. It could be said it is behavior problem, but I believe that it is an issue with ‘who is the pack leader – you or your puppy’. The reason for saying this is because puppy is fine with your husband leaving the house each morning. At that stage of the day puppy hasn’t seen you. But, once you appear then puppy takes control. It is clear that puppy is having you on! I say that in kindest way, because it is not puppy’s fault. It’s just what some puppies do and the behavior will continue though her life if it’s not checked now. I have seen this exact behavior in my own family with a standard schnauzer. The way to deal with this is you must show puppy that you are the pack leader. You can start doing this by firmly telling puppy to sit, then removing eye contact and leaving her to jump around and bark until she gets tired of it. Now, I am aware this is difficult as puppy will probably follow you. On this website there is a page about ‘Pack Leader’. I recommend you read the information on that page and see if you find anything that helps. However, I sincerely believe you need specialized information about what you must do to be a successful pack leader. There are links on that page where you can get access to some free video training from Dan. I am not sure if the free training will provide you with the pack leader information. I certainly hope it does. If you don’t get exactly what you need from the free training, there is a video course which can be subscribed to. The cost is approximately $37 for a month’s subscription. I know that in the full training there is much help for pack leader problems. There is also access to a forum where you can converse with other dog owners. One video, in particular, Dan provides excellent training on the type of difficulty you are having with your puppy. I sincerely hope this information is of help to you Ann. I wish you and your puppy many happy years together.